Back in the day, only 45 pilot teams were using the tool. But after a year already, Slack became the fastest-growing workplace software. In 2019, the tool continues to grow at a heady pace, boasting 10 million daily active users and 85,000 paid customers. I guess Slack is still having its moment. 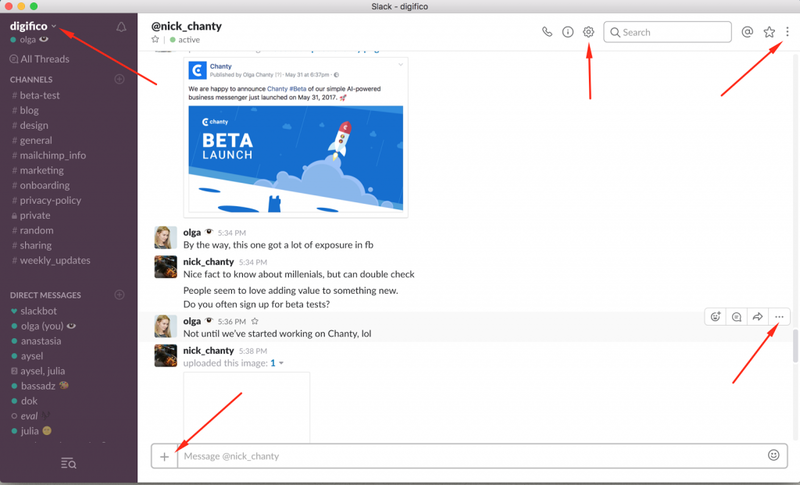 Building our own Chanty team chat, we’ve given a close look at Slack, as well as at other team chat apps. Exploring different tools helps us in building our own app – an easy-to-use business team collaboration tool with unlimited message history. Now, let’s give a careful examination of Slack. We’ll explore some of its key features and try to give the unbiased review of the tool. 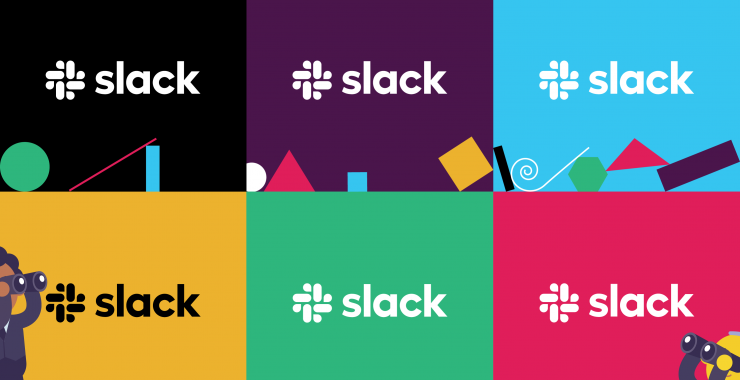 Slack: to love or not to love? People often develop love-hate relationships with Slack. Why? Apparently, the tool has some weighty pros and cons. Let’s list some of them. 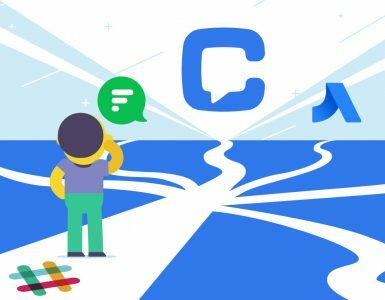 Since Slack is a solid tool used by some blue-chip companies (and millions of people altogether), many like the idea of joining the high and mighties by adopting the same app. 2. Slack works with multiple tools. It connects to nearly every app I know, having about 1,500 apps in its App Directory, which is great for those who use integrations heavily. 3. Slack is built around search. The tool has some advanced search options E.g. not only can you look through messages and files, but also the content within the documents. Hippiness, as well as other Slack’s characteristics, comes at a price. 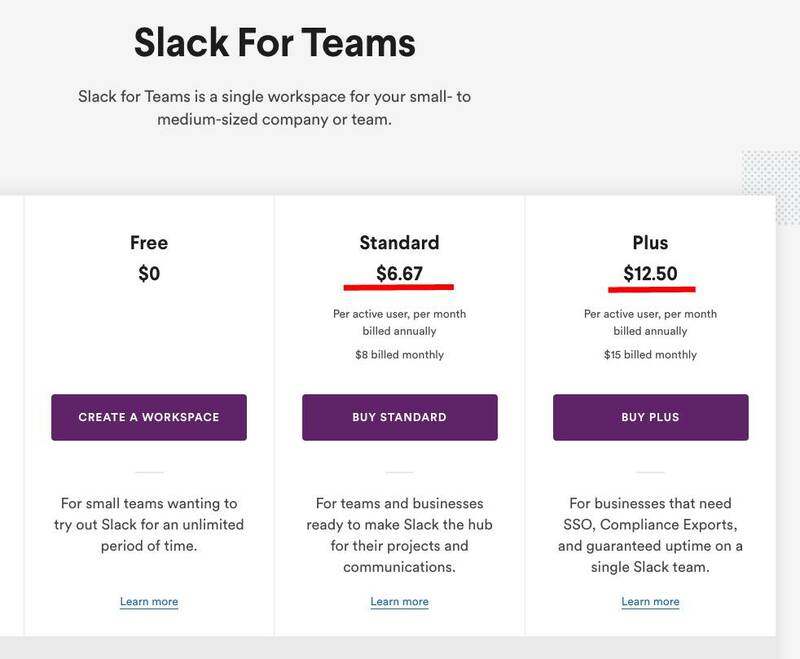 Not everyone admits it, but many refuse from using Slack exactly because of its price tag. 2. Slack can be overwhelming. 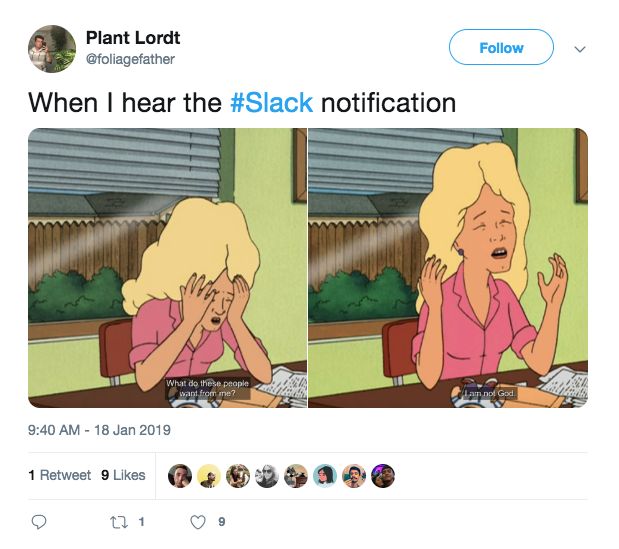 Imagine notifications from the endless list of Slack apps pouring into your workspace daily. Slack could be better if surviving the growth of information. 3. Slack’s search is limited (in the Freemium version). Search options in Slack are limited unless you pay. 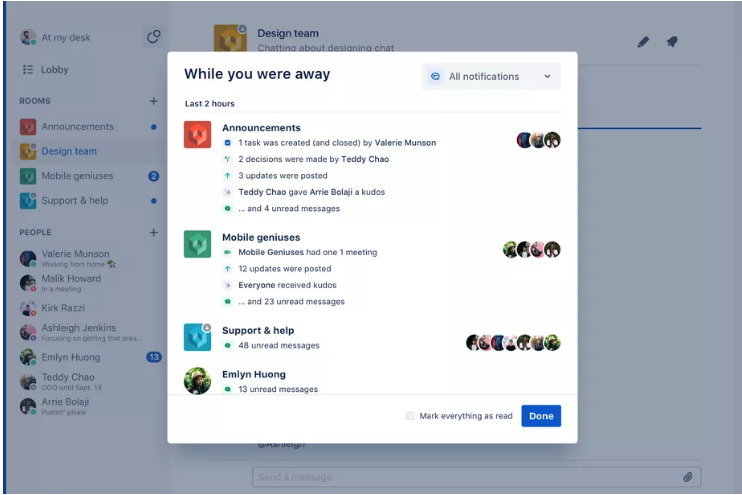 10K of your team’s most recent messages disappear in the blink of the eye. 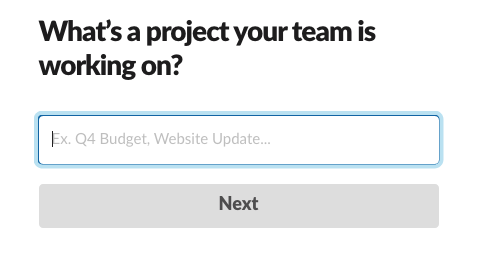 As we can see, Slack has some serious pros and cons. We’ll dive into some of its features right after discussing the price tag. 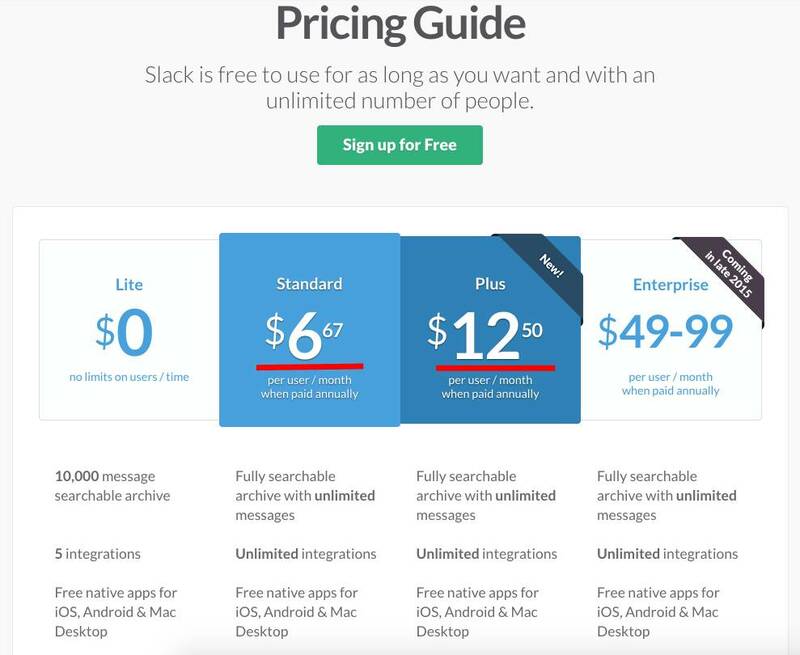 It’s kinda peculiar: Slack’s pricing has been consistent for more than 5 years already. It hasn’t changed since the official launch of the tool. Spot the difference. Despite Slack’s price tag being weirdly consistent, it’s quite hefty, as mentioned above. Compare the paid plans of different team chat apps. Of course, the price tag doesn’t say much by itself – the features included in a particular plan are no less important. But if money is of the essence for you, you can’t ignore the fact Slack is quite pricey. It all starts with an email. 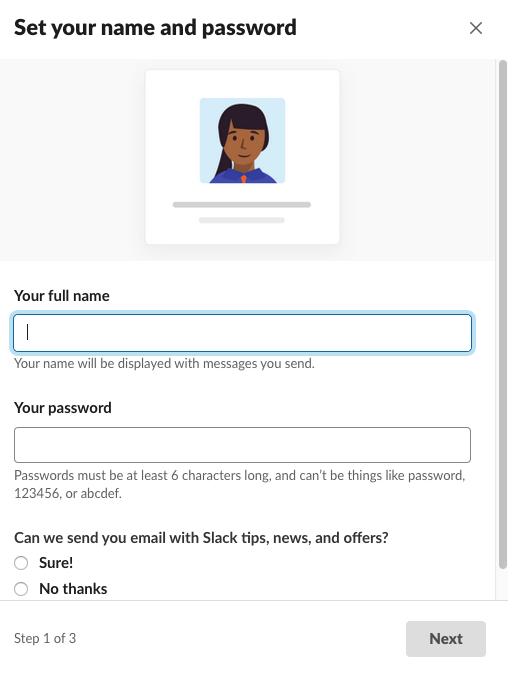 While some tools (like Workplace) ask you for a business one, your personal email can do just fine in Slack. After entering the confirmation code, you’ll create your workspace (if you don’t have one). You’ll be able to invite your colleagues and create your first channel. You enter your name and password, however, after getting to your workspace. I was going to tell you about all those modal boxes with pointers. These were exactly the features I saw in Slack’s product tour in 2018. However, when I signed up to Slack recently I encountered no product tour at all! All I saw were some prompts appearing right in channels as I was exploring the tool. Also, Slackbot was popping up with suggestions offering help. Apparently, Slack is experimenting with onboarding, so it’s unclear if its product tour is coming back. Despite Slack being our direct competitor, let me give it some proper respect. I think its product team worked hard on the user experience. Slack’s interface is quite intuitive, as it neatly wraps up different features behind the buttons, which is not the case when it comes to other team chats. As for customization options, you can make Slack’s left bar in any color you choose. Also, at the time this article is being written, Slack is rolling out a dark mode to iOS and Android beta users. Slack is basically a team chat, so messaging is its key feature. I’ll describe some basics about chatting in Slack below. So scroll down, if you know that. 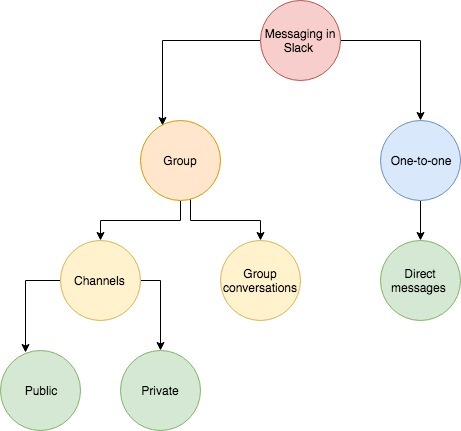 In a word, most of the communication in Slack happens in channels and direct messages. Channels are for group discussions: public ones are open so everyone can see what’s going on there, while private channels are confidential. Only the people you invite to private channels are able to join. 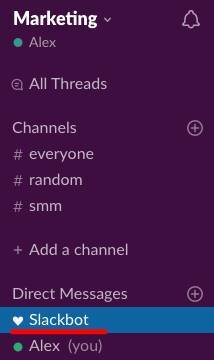 As an option, you can create a group conversation in Slack for up to 8 people. Later you can convert it to a private channel. Also, Slack has threads which have always been a controversial topic. Some think Threads create chaos, but others actually love them. In a nutshell, they let you respond directly to a message in a channel, keeping the replies organized in a single, threaded conversation. In Slack, Threads are just a messaging feature, while some apps (like Hangouts and Workplace) actually base their chats on Threads. It’s not only about messaging, though. 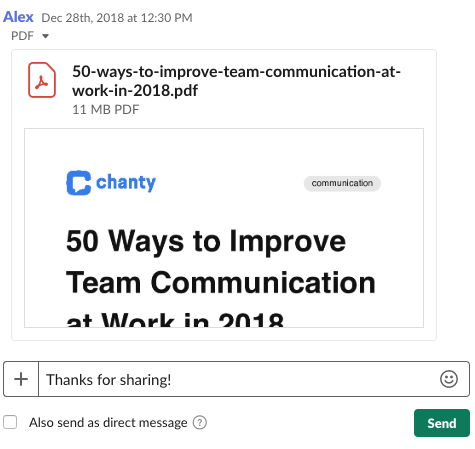 Like in all team chats, you can also share files, images, PDFs, documents, spreadsheets in Slack. You can add comments along with the attachments if you like. However, you can’t collaborate on a Word, Excel or OneNote doc without leaving the Slack, while it’s possible in Microsoft Teams. In Slack, the size limit for uploading a file is 1GB. If you try to upload a larger one, you’ll get a timely notification. Slack has 5GB file storage limit for a team in the Free plan. In paid versions, Slack offers 10GB per user in Standard plan and 20GB per user in Plus plan. 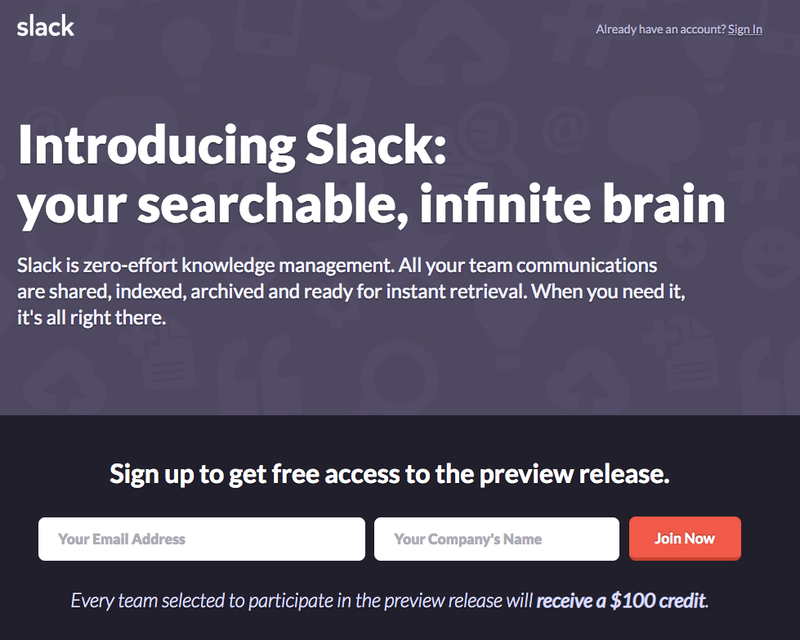 Slack is “built around search,” as its cofounder Steward Butterfield stated when the tool just launched. Messages, links, files are searchable like in many team chats. However, Slack also has a rare search feature – you can find what you need in the content within the files (Google Docs and Dropbox files are also searchable). Recently, I double-checked it. Long ago, I shared an e-book ‘50 ways to improve team communication’ in PDF. So I typed the name of a chapter ‘Celebrating workplace diversity’ to check whether I can find it via search. And it worked! A snippet of the book Slack found it! The similar feature is rarely implemented in team chat messengers. Hangouts Chat has smart search within documents so you can browse across your company’s content in G Suite, from Gmail and Drive to Docs, Sheets, Slides, Calendar, and more. But you have to pay at least $10 per user to use it. Slack’s notifications have been the talk of the town for years. Back in 2016, they suddenly became a big problem, which received wide publicity with so-called ‘Slacklash’ trend. 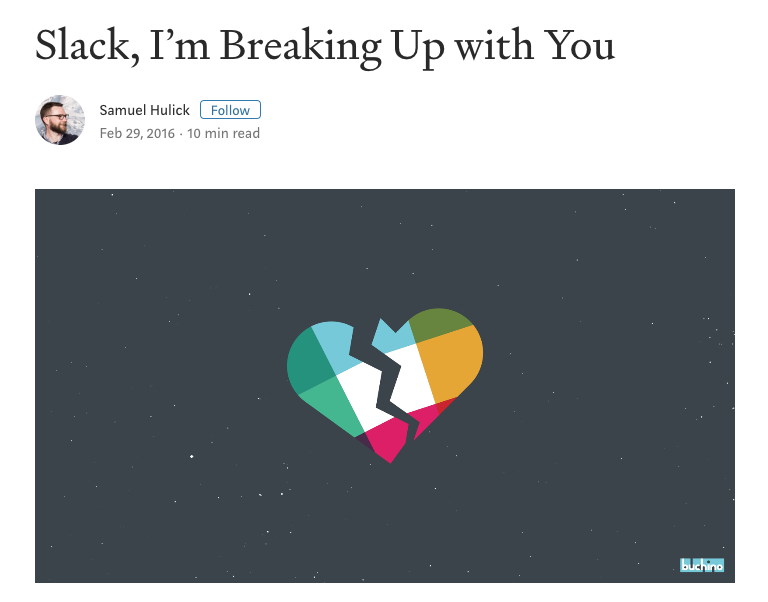 It all started with “Slack, I’m breaking up with you” article. Many users complained they have to deal with volumes of notifications in Slack, which makes them awfully distracted. Some observers even started chronicling backlash against Slack – the trend continued for quite a while. One must admit, Slack embraced the notification challenge. It strived to improve notification preferences and dedicated a special help page offering tips. Now, you can keep your concentration under control with channel-specific settings, keyword alerts and many other features. However, the issue is still here: even those multiple tools might not save you from being continuously distracted. If you have a huge team chatting in multiple channels or colleagues who don’t use @mentions sensibly, you can find yourself buried under tons of notifications. You know what would help Slack with this challenge? IMHO, it could be a single feature to summarize all notifications, like the one Stride had. The ‘While you were away’ box used to break up messages by channels and people and also aggregated what was actually done. ‘While you were away’ box in Stride. If you are tired of chatting, it’s time to call! I usually try this feature with my colleague Julia. 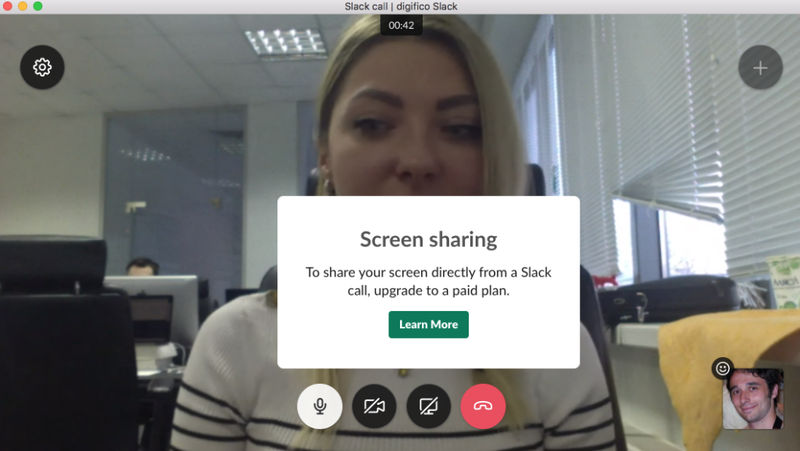 When preparing a meeting, we found out video calls in Slack are not supported on iOS and Android devices. What a shame! So we weren’t able to use our phones, but we launched the desktop version of Slack. Finally, we are talking. Yay! Hi, Julia. 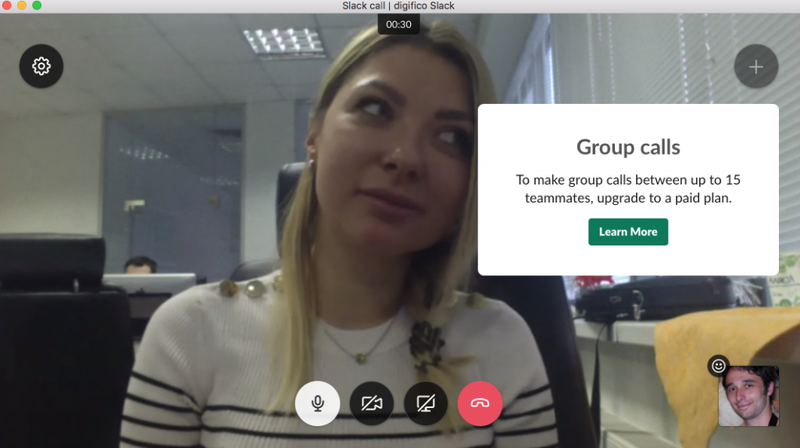 Since we used the Freemium version of Slack, we weren’t able to invite anyone to join our call, as the tool allows only one-to-one meetings. Generally, in Slack, there are no frills when it comes to video calls. 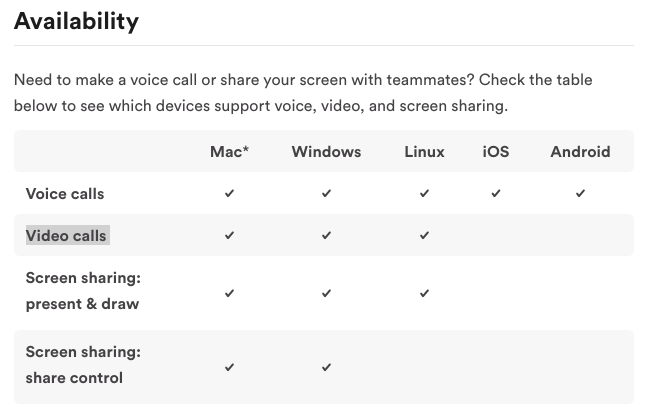 No screen recording option like in Teams. No chance to learn who’s the biggest blabbermouth speaker stats, like it was in Stride. Screen sharing is paid too. Here’s a timely reminder. Oh! Here’s a fun feature. Or, at least, it’s supposed to be fun. You can react with emojis to what your colleague said. However, for some reason the screen goes darker at the moment you send an icon. Don’t forget you can use integrations for video call in Slack, as well as for other needs and purposes. Slack shines when it comes to integrations. Mostly because the tool has really a lot of them – more than 1,500 as of the beginning of 2019. For those of you having a vague idea what integrations are, let me explain. These are the apps (of multiple categories, such as design, marketing, sales, etc) you launch to your team chat. I’ll provide you with an example in the next chapter. Let me just add two things here. Only 10 integrations are possible within the Slack Freemium version. Don’t know about you, but I’m puzzled. 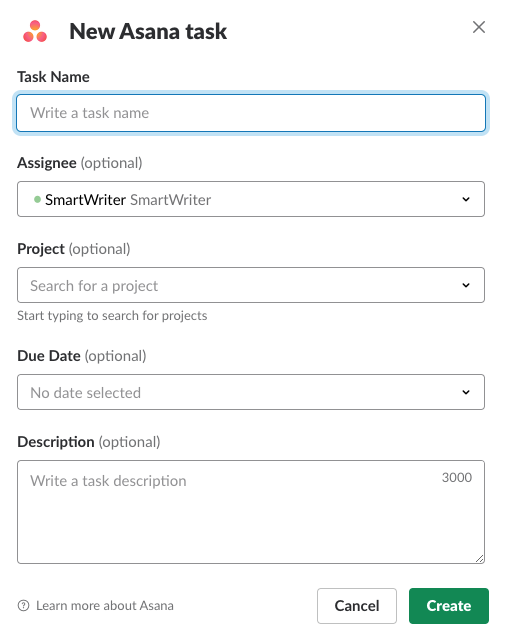 Why Slack hasn’t built its own task management feature yet? I mean, it got Actions last year allowing to create and finish tasks without leaving the app. But still, the feature is implemented via integrations, as described in this animation by Techcrunch. I tried Actions myself right after Slack introduced the feature. Let’s briefly explore how they work on the example of Asana. Right after you launch the tool by pressing ‘+’ sign it appears in your Apps list. Then you type in your request in the message box, according to suggested prompts. Let’s say you are going to create a task. Then, you would type “/asana create@. After this, Asana’s modal box pops up so you can set up a task. 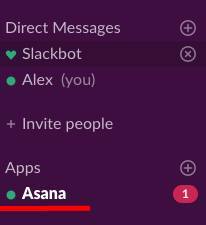 Right after that, the task appeared in your Asana workspace. By the way, you can choose other task management apps, such as Trello and Jira. In Chanty, by the way, the tasks are built-in. 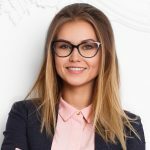 You don’t have to talk to bots (like in Slack) or connect to third-party integrations (like in Workplace). Create and assign tasks within just a few clicks! To try out Tasks in Chanty and enjoy its unlimited message history, sign up for the tool! Suppose I recently launched Slack and I’m still clueless about it. What if I need to do something that requires specific knowledge? Let’s say, my goal is to delete a channel. In Slack, I have three ways to find help. First, I can use SlackBot. It appears in my Workplace right after I signed in, so I guess it will show up in yours too. However, if you don’t see it in the left panel, you just type ‘Slackbot’ in the search box to find it. By the way, not many team chats use bots for providing help. You won’t find them in Flock or Workplace by Facebook. Microsoft Teams, however, does have the T-Bot. Anyway, you can ask a question to a bot and get an automated answer, which will be relevant (hopefully). When I typed in ‘delete channel’ in the message box, I got the link to Slack Help Center. 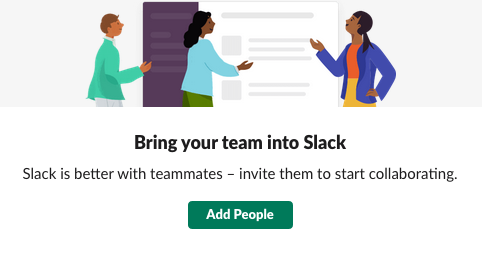 Second, you can address directly Slack’s Help Center by clicking on the ‘Help’ button hidden behind the three dots menu in the right upper corner. After just typing the word “delete”, the answer to my question “how to delete a channel” popped up. However, in the case with Slack, it may be even simpler to google your question. Chances are you’ll find the answer faster. I did my best to give a quick review of Slack describing its key features. I’ll reiterate the key points below. Pricing. 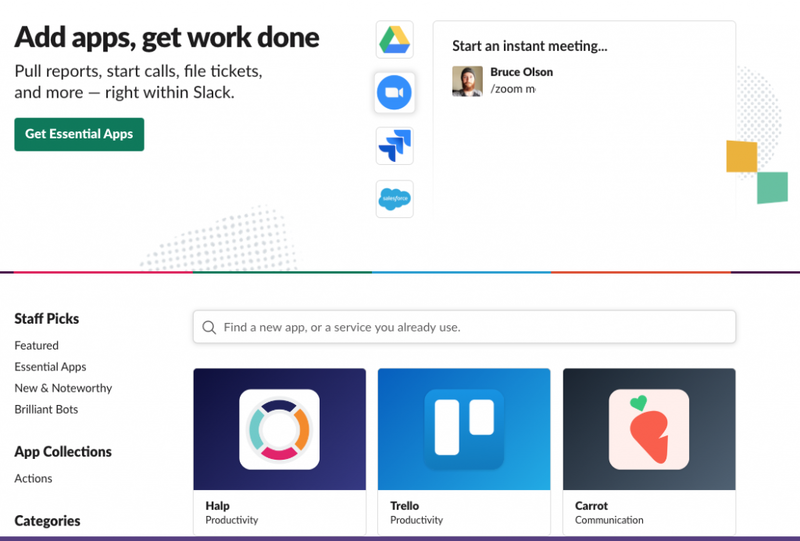 Slack is a bit pricey compared to other tools, while its Freemium plan is limited with 10K recent messages searchable and 10 third-party or custom integrations. Onboarding. I noticed no product tour in Slack as of March 2019. You’ll explore tool on the go with Slackbot and some prompts appearing in the tool’s interface. Messaging. Slack has Direct Messages for one-to-one conversations, while public and private channels are usually used for group discussions. You can also send group messages when communicating in a short-term, lightweight sort of way. File sharing. You can upload files up to 1GB or add files from Box, Dropbox, Google Drive, etc. However, you can’t work on, let’s say, a Word document in Slack without leaving the app (unlike in Microsoft Teams). Search. Since Slack was built around search, it has some advanced search options. Not only messages, links and files are searchable, but also the content within the documents. At the same time, message search is limited to 10K recent messages in the Freemium plan. Notifications. 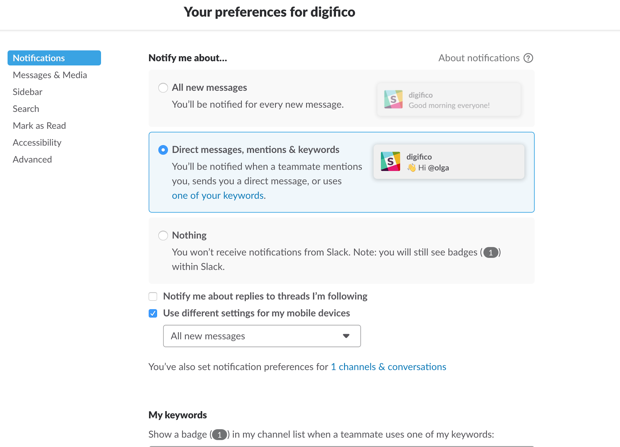 Slack has multiple tools for keeping notifications under control, such as keyword notifications. However, in the era of information overload they might not save you from being constantly distracted. Tasks are available via integrations. 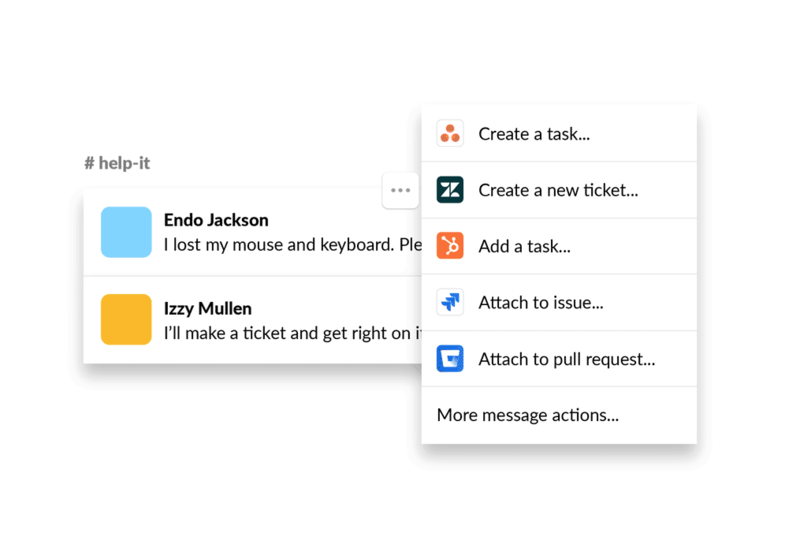 However, since the tool has introduced Actions you can assign tasks without leaving Slack, using Asana, ZenDesk, Hubspot and other apps. Audio and video calls. 1-to-1 calls are available in the Freemium plan, up to 15 people can be invited to a conference in paid plans. As an option, you can use integrations with appear.in or other apps. Integrations. Slack has 1,500 of them already with 10 integrations limit in the Freemium plan. Support is available via Slack Help Center or Slackbot. 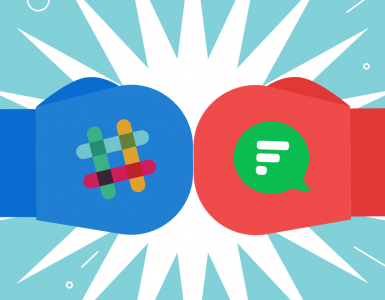 In a word, Slack is a popular team collaboration tool with some weighty pros and cons. 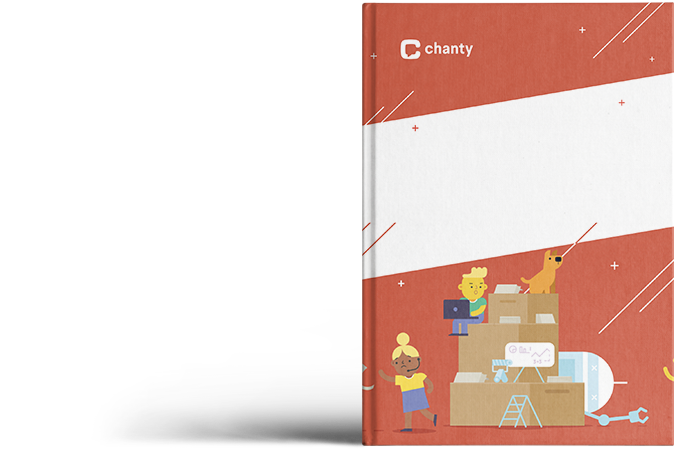 If it doesn’t suit your needs for some reason, why not to give Chanty a try? It’s a simple AI-powered team chat with unlimited message history, easy to start and to use.